Read and understand why a powerful smartphone like your Samsung Galaxy S7 Edge may sometimes experience being stuck during boot up or enter a boot loop and learn how to troubleshoot it when it happens. When it comes to powering on, it’s mostly the hardware and the battery that handle that but when it comes to booting up, it’s often the firmware, although we’ve already seen a lot of cases wherein the phone refuses to turn on due to firmware issues. But when the phone is stuck while booting up, we cannot blame the hardware because, apparently, the phone turns on it just couldn’t boot up. In this article, I will tackle this issue with the Samsung Galaxy S7 Edge being the subject of our troubleshooting. When the phone is stuck in boot loop, it means that when it starts, it may only reach the logo or somewhere before or after that, then it powers down and starts back up again and reaches the same point. It could go on and on until the battery is all drained. Another case we have to tackle here is the issue wherein the phone is stuck during boot up; it won’t reboot but it also won’t bring your phone to the home screen. If you own this phone, have recently updated it and currently experiencing similar issue, read on to know what to do. However, if you are trying to find a solution to a different issue, then visit our troubleshooting page for we have already addressed hundreds of problems with this device since it was released. Try to find issues that are similar with yours and use the solutions and troubleshooting guides we suggested. If they don’t work, however, contact us by filling up our Android problems questionnaire. Just give us information and we’ll help you find a solution. 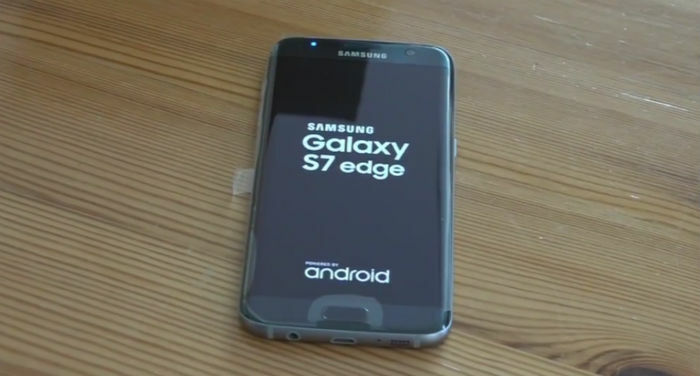 Problem: Hi, last night my Samsung S7 Edge went off itself and was unresponsive. I plugged it in and after a few minutes it restarted. When it got to the home page it showed that the battery wasn’t low at all. Trying to access apps it said there were errors with whatsapp, messenger and samsung cloud. It was late so l decided to leave it until the morning. Over night it rebooted to the ‘Samsung Galaxy S7 Edge page’ with the screen lit up. I cannot get it off this. I have tried to restart it holding the power and vol down button. It goes off but turns back to this page seconds later. Holding the home button and vol up seem to do nothing. Should l let the battery drain and then see if it’s different when l try to charge it again? Is there anything else l can do or does it need to get sent away for repair. I can’t think of any damage that has been done to it. When it happened it was just on my bedside table. Thanks for your help, Fiona. While in this state and the device is still unresponsive and unable to boot up, then you can move on to the next step. If, however, the issue is still happening, you can proceed to the next method for it may be a major firmware issue. As far as troubleshooting is concern you all already performed all the necessary procedures to fix the issue. But since the problem still not fix, then you don’t have a choice but to perform the last method by bringing it back your phone to the default settings. But remember, in resetting the device all files and data will be erased. So, before doing it make sure to create a backup by transferring all of it to your computer or SD card. If the problem is still not fixed after the reset, then obviously it is a hardware problem and you can bring it to the nearest accredited shop in your area to be checked by the technician. Problem: For some reason, my Galaxy S7 Edge gets stuck on the logo or black screen when I try to turn it on. It won’t continue booting up to the home screen which is very alarming since it was working fine prior to the Nougat update. I haven’t really noticed any significant events that may have led to this problem except the update. So, if I’m right, the new operating system messed up my phone completely. It’s been like this for 4 days now and I badly need your help to make it work again. Thanks. Troubleshooting: Based on your description, it’s pretty much a firmware issue since it started shortly after the update. And for this, the best thing that you should do or the most effective procedure you may be able to use is wiping the cache partition. It deletes and replaces all possibly corrupted system caches. You may also be right about the update messing up your phone but please note it might not be a serious issue. However, if the wiping of the cache partition didn’t fix the problem, then you have to do the master reset before you seek assistance from a technician. Simply follow the same troubleshooting as the one above as these issues are basically the same and might have been caused by the same factor–update. There are cases wherein this issue hinders the phone from getting inside Android system recovery menu (recovery mode), so you just have to press and hold both the Volume Down button and the Power keys together for 10 seconds until the phone reboots. The procedure is called Forced Reboot or soft reset, which is effective in dealing with minor firmware issues and crashes. Hello, I am having the boot loop issue as well, but when I attempt to start it up to go to clear cache, the yellow triangle exclamation point pops up, saying “No command”, it responds to no button combination from here, aside from turning the device off. any recommendations? How to go to home when phone is in bootloop? I am in a bootloop. I can not turn off the phone. It boot and show Samsung Galaxcy S7 edge logo and the blue screen “Installing system update” 0,5 sekund and then blue screen error, yellow wooden edge. Thanks so much for these clearly written instructions. They helped me reset and then use my S7 Edge. THANK YOU! You saved my phone and many moments of frustration. I had to clear the cache and it worked perfectly fine – thanks!